Nothing adds a sense of romance to a master bedroom quite like canopy bed curtains. While a fine shroud of netting may serve the more practical purpose of protecting one from flying nighttime pests, sheer canopy panels can also be used to add an elegant, classy look to four poster canopy beds. 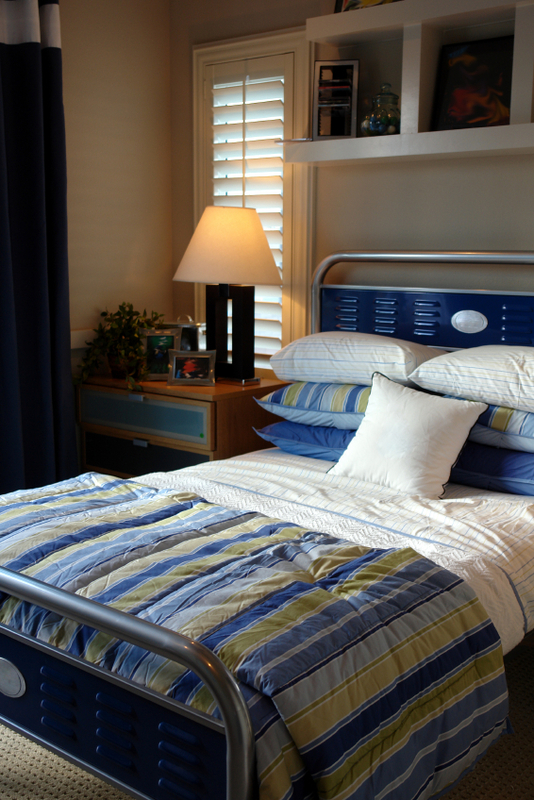 Some canopy designs can be hung from the ceiling, allowing you to dress up practically any type of bed. Pottery Barn Kids has over a dozen different canopy designs to enhance a young princess's bedroom, including canopies that look like roses and daisies, and an adorable birdcage canopy. You can find both ceiling-mounted and sheer panels for canopy frames. Bacati canopies come in bright, whimsical colors, making them the perfect bed accessory for kids, teens and even young adults. In addition to round, hoop-style sheer netting, you can find string-style canopies with hoops or in straight panels that can be trimmed with scissors to the desired length. You can find these canopies at the Bacati​ website. If you want a colorful canopy that stands out like this bright pink sheer panel canopy, Bacati might be the brand for you. Sheer and mesh canopies are the most common and easiest style of canopy to find online. If you prefer a different style, such as a crown or coronet style canopy, you may need to look for a custom or handmade canopy. A handmade canopy can be tailored for an exact fit for your bed and your decorating style. Etsy is a good place to look for handmade bed canopies, such as this adorable kids canopy made by Amber Yoo of Ladymantis Boutique. Casablanca bed canopies will work with four poster canopy bed frames and can also be installed using four ceiling hooks. The four point style canopies come with four matching canopy ties that allow you to tie back the side panels during the day, similar to curtain panels. A variety of colors are available for beds ranging from twin to king size. Casablanca Oasis style canopies hang from a single ceiling hook (a single point canopy) and have a hoop that distributes the rest of the canopy around the bed. This style fits all bed sizes and also comes in a variety colors. This photo of a sheer canopy that is suspended from the ceiling is similar to a Casablanca canopy. Mosquito net canopies can be made from cotton, silk or polyester. These attractive bed canopies are both decorative and functional. With a mosquito net canopy covering your bed, you can sleep with the windows open. Mosquito Nets also makes insecticide treated canopies certified by the World Health Organization. Visit the company's website for an image gallery showing how the different canopy designs can be used to enhance and embellish your bed. The Isabella collection has a single point round canopy and the Madeline collection has a box style sheer canopy that can be used on a four poster canopy bed frame. These classic bed canopies are made to order and usually require 3 to 4 weeks to complete. Once the material is cut, the order cannot be canceled. This classic style is similar to the styles you can find at California Kids. Mombasa Sheer Lifestyle makes elegant canopies for both indoor and outdoor use. These canopies will not only look great in your bedroom, you can also use them on a porch or patio. Their largest mesh canopy, called the Majesty Canopy, looks like it's fit for royalty. Large enough to accommodate a king size bed, this canopy can be hung from the ceiling or over a four poster frame. You can also use this canopy for a dramatic effect over a large, outdoor dining table. You can find Mombasa canopies at: Macy's. Bed canopies have been around for hundreds of years and show no sign of becoming unfashionable. Whether you love the look of an antique Victorian style canopy or you prefer to shroud your bed in a sheer curtain, an adult bed canopy helps you add color, texture and a hint of Old World or exotic romance to your bedroom. A bed canopy in a girl's bedroom will help her feel like a princess. With the right fabric and style, you can even make a canopy work in a boy's room, whether he's the master and commander of a unique sail bed or he likes camping out underneath a camouflage, tent style canopy. With a little imagination, you can use bed canopies for practically any situation.